Textkraft is a series of professional writing apps for iOS devices, specially developed for authors, editors, translators and other prolific writers. The apps for iPad, iPhone and Apple Watch were downloaded more than 5 million times since 2011. The new update 4.1 of Textkraft Professional for the iPad comes with many new and updated features, that are primarily for self-publishers of great interest. Texts can now directly be saved as an EPUB formatted e-book. The exporter gathers all required and usefull meta data for the publication. In addition to standard data such as the name of the author and the publisher, the cover image can be set and a table of contents can be generated from the structure of heading styles used in the document. Completed e-books can be shared as an attachment, saved locally or in a cloud, or can be directly stored in Apple's iBook app. 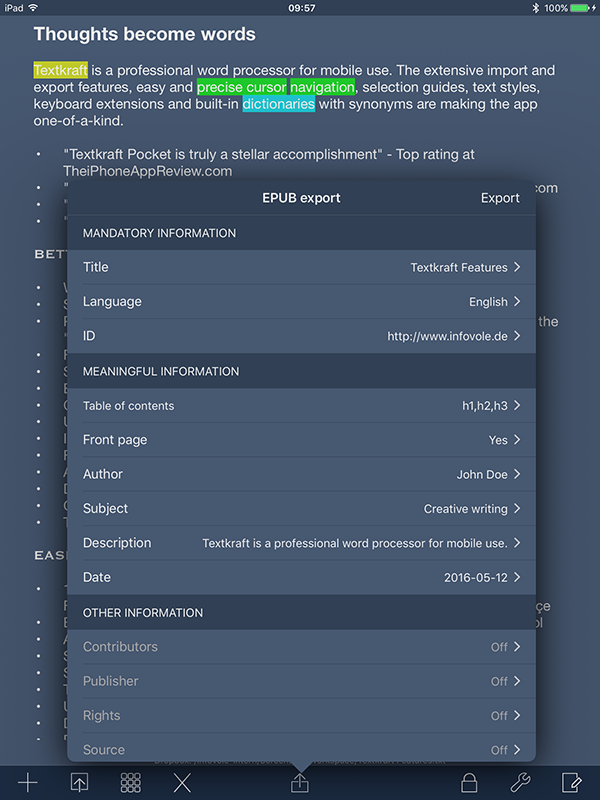 Beside the comprehensive export function, Textkraft can also open EPUB e-books for reading or import the text of an e-book including the supported text styles for editing. For the finalization of the text prior to publication, the integrated and extended dictionary with synonyms has been greatly improved. Unknown words can now be learned temporarily, so that they are only valid for the current project. A prediction and correction menu can be shown directly in the text. It only replaces words when the user taps on a suggestion. The system uses a newly developed text corpus, which learns the favourite words and subjects of the writer to make better suggestions over time. The corpus is secured by Apple Data Protection and can not be made visible. Furthermore, non-breaking spaces and hyphens can now be written and a new option allows it, to make non-breaking spaces visible in the text. Important functions are available as key shortcuts on external keyboards. The command key can be hold down to display the options. Regular expressions can be used for searching. For instance "grep:t" searches tabs and "grep:[0-9] " finds numbers of any size. With the new Textkraft Professional we deliver the first comprehensive, mobile production studio for self-publishers ... Starting with the primary text capture, through the correction process, up to the publication as full-featured e-book: Textkraft has all the features to write and publish on an iPad as productive as it was only possible with a laptop before. 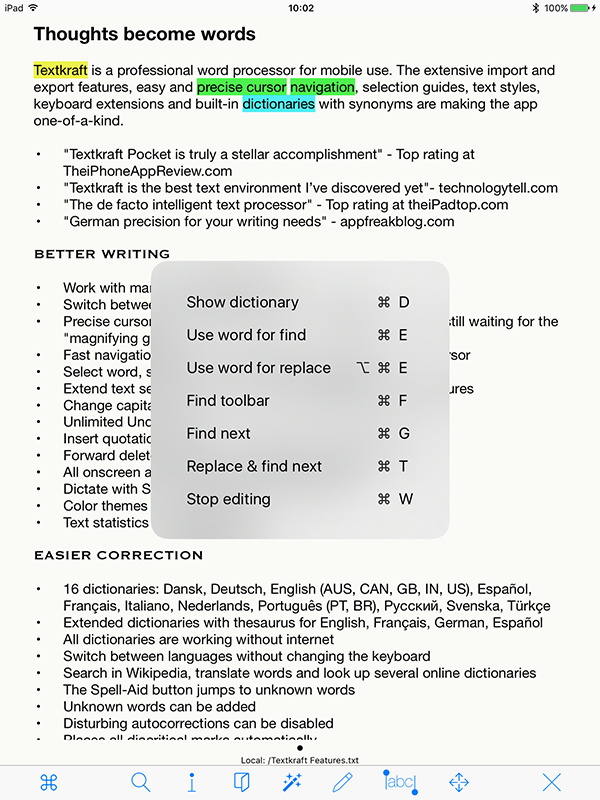 Textkraft Professional 4.1 is available today at the App Store in the Productivity category. The app is optimized for all iPad devices, including the iPad Pro. A discount of $4.00 (USD) is offered for the next 10 days, which reduces the price to $14.99. Neuss, Germany - infovole GmbH, based in Germany, focuses on the development and marketing of mobile applications. Consulting, conception, design, development, App Store distribution, ASO and marketing; the service line portfolio of infovole covers the entire production and conversion chain of a mobile app. All Material and Software (C) Copyright 2016 infovole GmbH. All Rights Reserved. Apple, the Apple logo, iPhone, iPod and iPad are registered trademarks of Apple Inc. in the U.S. and/or other countries. Other trademarks and registered trademarks may be the property of their respective owners. The system uses a newly developed text corpus, which learns the favourite words and subjects of the writer to make better suggestions over time.